Macat is a global leader in developing critical thinking skills. Our unique solutions helps institutions, businesses and individuals to effectively measure, analyse, and develop critical thinking, contributing to greater personal and professional success. 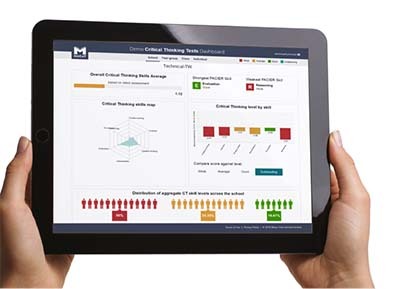 Developed in partnership with leading academics, Macat Critical Thinking Assessment & Development combines assessments, analytics and engaging learning resources to create one complete critical thinking development solution. Mike read history at Cambridge and received his PhD from King's College London. He is the author of seven books, including studies of the Dutch tulip mania and of police corruption in New York, and is a prolific public historian, acting as a featured contributor in history to Smithsonian Magazine and having appeared on well over 300 radio and TV shows. Mike has been Macat's Chief Learning Officer since 2012. Roy is very widely known in the field of critical thinking. His experience is, in many ways, unrivalled. It includes the production of assessment materials in the UK over many years (during which time, he was a Chief Examiner in the subject for the formative years of its assessment). He has extensive experience in training teachers both in the UK and in Singapore. He has also taught thousands of students in various countries over the past fifteen years, at all levels of education (primary, secondary, college, university, and in prison education). He has produced innovative resources, and is renowned for effectively linking creative and critical thinking. He is the author of many articles and books on the subject. Indeed his critical thinking books (and other resources) are used in many countries in the world. He is co-founder and Director of Studies of the Centre for Critical Thinking in Singapore. Comprised of leading experts in assessment and critical thinking, the Technical Advisory Board's role is to preserve the unique selling proposition of the critical thinking assessment product, including high quality research as a solid foundation, accuracy of measurement, precision of assessments, fast assessment completion and instant analysis/comparison of assessment results. John is an expert on empirical scaling of language abilities. At Pearson (2006-2016) he developed Pearson Test of English Academic and the Global Scale of English and led the framework development for PISA 2015, 2018 and PISA for Development. Richard has published on critical thinking and argumentation and the development or reading in the digital age. His teaching and research interests are writing development, argumentation, poetics and research methodologies for the digital age. Michael pursues a research program on the use of argumentation in classroom and Internet discussions and in argumentative writing as a tool for conceptual change and critical thinking. His current emphasis is on teaching critical questions for evaluating arguments. Sarah studies the dynamic processes through which groups and teams engage in creative and knowledge work. Her research interests include creativity, innovation, dynamic processes, decision making, and diversity in small groups and teams. In particular, Sarah is interested in the processes through which interdisciplinary and cross-functional teams integrate members’ knowledge to produce new ideas and make decisions. Mark has worked on the development of educational and psychological tests, educational policy related to testing, and psychometric theory. He has specialized in applications of item response theory (IRT) models, computerized adaptive testing (CAT), assessment using performance tasks, standard setting on educational tests, and methods for evaluating the quality of teacher education programs. Mark has consulted and lectured for a number of pharmaceutical companies (including Reckitt Benckiser) for activities related to health psychology models and interventions, and received research support from charities, government and industry sources at various times. Raymond's passion is in the fields of leadership, critical thinking, operations and management. Through The Leadership Paradigm - a leading provider in the field of leadership skills enhancement and management - Raymond delivers seminars and workshops that are fun, interactive and designed to maximise learning retention.